We’ve eaten our share of fried chicken sandwiches, but few approach the beauty of the B.F.C. from Finch & Fork in Santa Barbara. 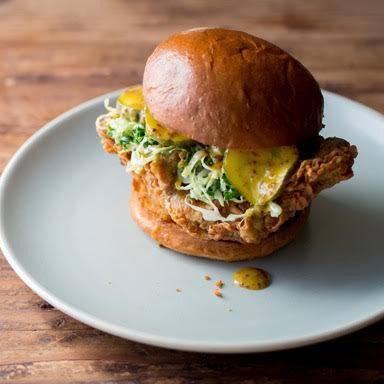 Chef James Siao nails all the details — from the mustard to the slaw to the all-important fried chicken — for a sandwich that’s as wolf-it-down delicious as it is photogenic. The bread: A brioche-style bun just substantial enough to hold this glorious creation together. The filling: Let’s start with the chicken: it’s marinated with rosemary and thyme, then dredged with cayenne-spiked flour, then buttermilk-ed and deep fried ’til golden. The secret ingredients: The mustard is a honey mustard that Siao actually smokes, for another layer of flavor. The Bread & Butter pickles are made in house, and the slaw is made from kale and cabbage, with a lemon-yogurt dressing. Which means this whole thing is actually good for you. No, really. We promise.